Harry Potter and the Half-Blood Prince (2009) – Movie Review – Another Movie Blog! Half-Blood Prince is an odd beast of a film. It is in one essence the darknest film in the whole series, both literally and figuratively, with the plot coming to such a pessimistic conclusion that it makes its whole status as a middle-child film into the feel of the film itself. At the same time it also has the most overt comedy of any Harry Potter film, from the romantic elements to everything with the liquid luck. This would be a hard task for any film, but Yates manages to juggle all these elements quite well. For the most part, anyway. Despite my high enjoyment of this film, this is the entry in the franchise that frustrates me the most, because it had the potential to be the best. 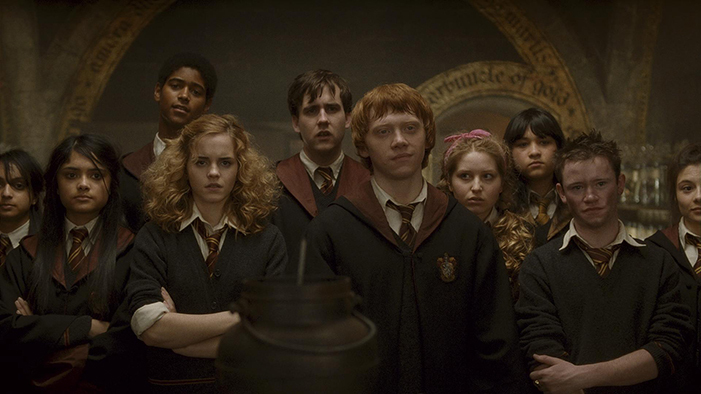 Although I maintain that Prisoner of Azkaban is the best directed in the whole series, this is certainly the best looking of all of them. Most of the credit there goes to the cinematographer Bruno Delbonnel, who does work here more extraordinary here than many major blockbuster I can think of in the 21st Century. It’s not very often that you can compare studio franchising to the work of Ingmar Bergman, but between the strange angles, the strong colours and the rich darkness it is deserved, all helping to accentuate the themes of the all encompassing evil that is spreading in this wizarding world. This was the only film in the series to be nominated for the Best Cinematography Oscar, but it would have been regardless of what movie it was in. It truly is a high water for the look of blockbuster films. Much of the cast also keeps to this high standard. There’s only one huge cast inclusion in Half-Blood Prince, which is the wonderful Jim Broadbent, who brings Professor Slughorn alive with an eccentricity and a true sense of pathos that is quite remarkable, and I believe really improves upon an otherwise lesser character in the books. Whilst in the last two films Radcliffe flexed his acting muscles in the more dramatic scenes, here it is the comedy moments he shines. From more awkward comedy moments to the scenes in which he is on liquid luck, you can see the connection between him here and now him starring in a farting corpse movie. Michael Gambon gives all the grace and imposing figure he has to offer given his role in this film; I honestly cannot imagine how Richard Harris would have played those scenes in retrieving the (fake) horcrux, and I honestly don’t think he would have done it better. Tom Felton gets the most substantial role he has to do in the series and he plays the struggle for his soul well, and Helena Bonham Carter is as delightful as always. But I started doing this series of reviews in the wake of Alan Rickman’s death, and it is here that he begins his role in the plot going forward as the unrewarded martyr. It is only later on in the series that we discover these elements, but as I had read all the books before this movie I have never been able to see these without noticing the pain and sacrifice Rickman conveys as he has to commit to his unbreakable vow. But that act, the one where he – spoiler alert, obviously – kills Dumbledore, has always been a source of contention for the book loving part of my brain. In the book, Harry is paralysed and is completely powerless to do anything. In this movie, he just stand there like a Muppet. This viewing this decision didn’t bother me as much, being the ultimate extension of Dumbledore’s authority over others, but it still really muddles and confuses maybe the most powerful scene of the whole book series. But that didn’t bother me anywhere near as much this time as how much lovey-dovey filler is in the first half. On one level, with the apocalyptic stakes of these movies going forward, these ill-fated romances are filled with genuine warmth amidst such darkness (Emma Watson in particular sells the hell out of her moments). And in the same era that the Twilight saga was being released, these are not the most painful (or offensive) example in the genre. But, still, for a movie called Half-Blood Prince the hormones take way too much of the screentime. And whilst I have praised all the main cast thus far, I have to say that Bonnie Wright, the actress who plays Ginny Weasley is just…not great. Though she does sell the Room of Requirement scene.